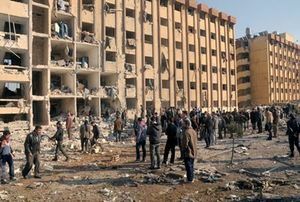 Twin explosions rocked a university in Syria's largest city of Aleppo on January 15, 2013, the first day of exams, killing a reported 87 people, students and others, and wounding hundreds (the death toll may have risen eventually to more than 90). As usual, both sides blamed each other; rebels and activists blamed a government air strike, while the government blamed terrorist rockets fired from the northwest. This page doesn't seek to cover the issue comprehensively, but to focus on key issues relating to settling that blame question. The content below is incomplete, with ongoing investigation, especially of the physical/visual evidence, being organized on the discussion page. At some point, the findings will be pasted up front (below), and elsewhere. The best measure of what happened in a case like this is the physical evidence, which can be partly assessed from the visual record. Among those leaping to blame the Syrian government, none has shown much eagerness to explore that like ACLOS has at least started to, on the sub-page Aleppo University Attack: Physical Evidence and more so at the moment on its discussion page. 1 A Jet Strike or Not? 2.1 Syria Blamed Car Bombs? 4 A Weapon Only the Regime Has? A Jet Strike or Not? The answer to this central question, apparently, is "not." The clear reports of a government fighter jet were credited, and underpinned all early condemnation of the attacking government. By now, however, the other evidence has had its turn to refute these alleged witnesses and is being recognized - as quietly as possible - as winning the dispute. Mohammed Sergie collected these and other accounts for Syria Deeply, summarizing their case for a jet attack and claiming that "people living in government-controlled areas of Syria ... aren’t allowed to film in public," perhaps explaining why there was no video of showing it. But of course videos were filmed, and they simply didn't show the jet, by visuals or sound. In another tweet, "Edward Dark" said "I myself was driving up the road, just a few miles away from the jet strike. I clearly heard a jet fighter swooping, then a blast #Syria." Whether even this blast could be heard for miles, while driving inside a car, is at least somewhat questionable. A closer witness said "when the plane roamed above the university following the shelling, the university guards and soldiers told us, 'hide, the plane is back!'" A student calling himself Simon told CNN "I was on campus when I heard a plane over head from a distance. 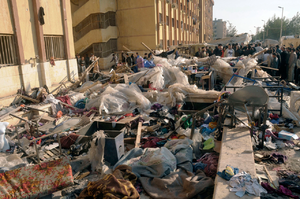 Suddenly a loud explosion erupted just 50 meters away at the gates of the College of Architecture ... Minutes later a second blast exploded a few meters away." He mentions no jet before the second blast, and as we'll see below, video filmed from about 100 meters south of the blast has no audible jet sound whatsoever in the 28 seconds preceding it. Everybody says they saw or heard it, but the video never seemed to show this jet, or to have captured its noise. One early posting captured the sound of the explosion from behind buildings nearby. There was no preceding sound of a fighter jet's roaring engine. A full week into the news cycle, a dramatic second video surfaced on January 22. This quickly made waves with its new view from the front/west side of the stricken dorms, capturing the powerful explosion. And to the careful eye, it showed the apparent projectile on is final approach. This also featured no sound of a jet engine, but spurred a new and more detailed round of analysis. At least two prominent media research people took the evidence to experts, and returned with two quite different conclusions. The important point so far, from an investigative standpoint, was a January 23 article by Robert Mackey on his New York Times blog The Lede: "Video Suggests Missile Hit Syrian University." Like Miller, Mackey made some sport of disproving the car bomb claims no one made, but otherwise refuted what activists had said. He got three experts to look at the video, and got a general consensus there was no sign of a jet, just a powerful missile or rocket fired from the Earth's surface. Frame 516 of video showing the blast. The cameraman seems to be turning the camera toward blast site already earlier. None of those cited felt the University was targeted on purpose. Mr. Holliday suggests "their Scuds just aren’t accurate enough and they screwed up – big time." Mr. Chivers agreed, noting many missiles used recently “miss by a kilometer or more” from what he thinks they meant to hit. “And that may be what happened here." However, there were two strikes, precisely near each other and three minutes apart. It doesn't seem likely the government "screwed-up" in the same basic direction twice in a row (although if it did, "big time" might be a good descriptor), especially when there were no known military targets anywhere nearby. Rather, as the government noted, this follow-on attack in an area of previous calm is more similar to the work of terrorists (if usually using car bombs, not rockets/missiles). These seem to be intent on disrupting life, hitting all signs of government authority, and threatening those who insist on embracing that authority. And whatever clues there are against a jet, Miller’s unnamed U.S. officials assure us it must in fact be a jet, “flying at altitude.” This is supposed to confirm the activist students, whose claims of a jet underpinned the “world community” rejection of Damascus' story. However, a jet so high or distant it can’t be detected by cameras can hardly be the same craft activists described, clearly audible, “swooping low,” “roaming above the university,” visibly looping back to fire again, and so on, as seen by “nearly everyone in Aleppo.” The two jet supports don't really support each other - rather, they contradict and trip over each other, in an apparent rush to get the blame on Syria's still functioning Air Force. Either way, and even if there were two jets, one high and one low, neither of them would be capable of firing a Scud/Farj 5 class weapon, and so would probably be utterly irrelevant to to the death and destruction on the ground. While it's often repeated that the authorities blamed terrorist car bombs (or a car bomb) for the carnage at the universirty, this is not substantiated anywhere by any direct quote, named official, or any detail suggesting the claim is actually true. The most commonly cited source is Syrian activist "Edward Dark," who actually tweeted "another thing u should consider about Aleppo uni. bombings. First claim by regime was mortars, then a car bomb, then to rebel rockets." No one much mentions the mortars part, but many people seem to believe car bombs were specified. Citing all the instances would be tedious, but any check of the mainstream crtiques will show this is a leading argument - and it seems to be an urban legend. It's been argued by some these reports might be edited later, since everyone knows the government first blamed car bombs rather than a fighter jet. 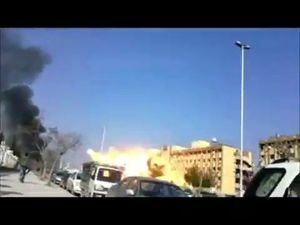 But the Guardian reported at 2:21 GMT on the 15th (about three hours after the blasts) "A Syrian government official in Damascus has told the Associated Press that two rockets hit the University of Aleppo's Information Technology Academy. The official said the two rockets were fired from a rebel-held area in Aleppo." The AP report, plus an AFP one mentioned, surely exist and will back this up. Syrian authorities can hardly be blamed for these swift confirmations. There was an implied story change reported by ITV News' Bill Neely on January 16, but, he thought, the change was backwards from the one in question. 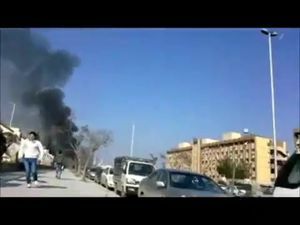 "[The government] said initially two rockets were fired from a rebel-held area of the city and hit the university. [...] The government has now changed its position. Syria's Information Minister has just given me another explanation. Omran al-Zouabi says the Islamist extremist group Jabhat al Nusra is responsible." Nowhere is it specified this is a different terrorist group than they first blamed (it wasn't specified), or a different method. Al-Nusra does usually use car bombs, but they're only named as a guess, and it could be an al-Nusra rocket attack that al-Zouabi meant. Further, Addounia/Duniya TV, a private Syrian network, filed a report, apparently with presenter Shadi Helweh, that two sources suggest reported "a car bomb"  or "a ground explosion." By both sources, Helweh was beaten up by "the students" for "the outright lie" or "lying in front of our eyes." The only relevant posting from Addounia that can be found on the Internet is an English sub-titled report from the 15th. By the subtitles anyway, their first take was exactly the government's - two rockets from Al-Lairamoun. 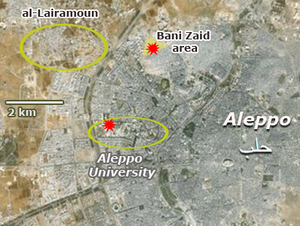 The death of students and displaced people sheltering in the dorms are mentioned, along with rockets on Bani Zaid. A car bomb is not mentioned. There is still no conclusive proof there wasn't a car bomb involved. While a surface-fired rocket is clearly indicated for the second strike, and generally accepted for the first, a scenario like Al-Khabar may have reported - beginning with a car bomb, and followed up with two rocket attacks - remains a possibility until it's been ruled out. And conversely, until it's been shown to have been alleged by anyone relevant, it should be considered an irrelevant point at best, or a deceptive straw man argument at worst. In short, the government has said what it's said, has presumably investigated, and has perhaps already published the findings. But they're not coming through clearly if so (that is, we haven't searched deeply). Sadly, A Closer Look on Syria (ACLOS)'s under-staffed investigation is moving slowly. When we get a handle enough to say much, that will be summarized here. Until then, the page linked above will house the evolving findings. These are/will be based on analysis of photographic and video evidence of the missiles/rockets and the damage they caused, and what can be determined about them and their method of use. A Weapon Only the Regime Has? Some things can be stolen. Increasingly, weapons once held only by the government become owned by rebels after the take over a base. Numerous bases around Aleppo have been conquered in recent months and weeks, if briefly. Rebels have in fact filmed themselves standing over stocks of rockets and truck-mounted missiles, in some cases. The condition of these finds, the relevance of the model and payload, and how long they managed to retain access to the weapons are all unknowns. Just where and when these discoveries were made is not even certain, in most cases. Another way rebels might get a missile is by importing it across one of the borders. There are at least some crossing at some times they could manage that, there are plenty of people willing to try and supply them with nearly anything, and they’ve had plenty of time by early 2013 to have arranged something like that. There remains no proof, however, of such a transfer. Clashes took place by the police academy in the Khan al-Asal area of western Reef Aleppo, where rebels from several factions, including non-Syrian combatants, have been trying to storm for several months; they are using home-made rockets. A rebel factory was busted by the authorities in Aleppo (area not clear) on or just before the day of the University attack, according to a SANA video. Explosives were being made there, it was said, along with custom-made armored vehicles, shown halfway through some fairly high-end work. It’s not hard to imagine the same people trying to work with rocket engines and explosive warheads. Range doesn’t even matter much for western Aleppo; Khan Al-Asal itself, Al-Lairamoun, and the University are within a five-mile area with only vulnerable checkpoints blocking free movement. The question would be how powerful they’ve been able to make the things. All known design specifications would be out the window here, and replaced the complex science of rocket production under unknown circumstances. [Syria's Information Minister] Omran al-Zouabi says the Islamist extremist group Jabhat al Nusra is responsible. He says the twin explosions a few minutes apart, the intent to kill large numbers of people, the targeting of a government building and the capability of the group to do such a thing, all points to them as the most likely perpetrators. Al Nusra does indeed go in for spectacular mass killings. [...] But al Nusra doesn't claim its attacks. Its policy is secrecy; deeds not words. 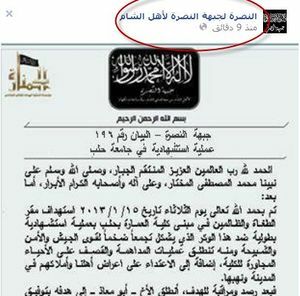 Announcement on Al-Nusra Front's Facebook page (??) annoncing responsibility for the attack. This blame is clearly speculative, and, as noted above, it's not clear this is a changed story at all. Groups were fought in Al-Lairamoun, but perhaps there was no clear link to the attack found among them, and officials were still left guessing. There is more direct evidence of Al-Nusra involvement alleged, but not with high reliability. The following claims are unsubstantiated, but worthy of note in case they're true. Alleged leaflet calling for a boycot of studies. "Al Nusra Front, the terrorist group deemed al Qaeda in Syria adopted (claimed responsibility for) on its FB page for the attack on Aleppo University. The post was then deleted 12 minutes later. The post says the attack was by a suicide bomber in a car filled with explosives, targeting Aleppo University, shabiha and a security base. Though it's still not confirmed what the University was attacked with exactly, Al Nusra Front appears to have been behind the attack." "Al Nusra Front, the terrorist organization deemed al Qaeda in Syria has basically just exposed themselves as being behind the Aleppo University massacre which left 82 people dead by distributing leaflets in Aleppo, threatening the people against sending their children to the university for exams prior to the attack on the University. 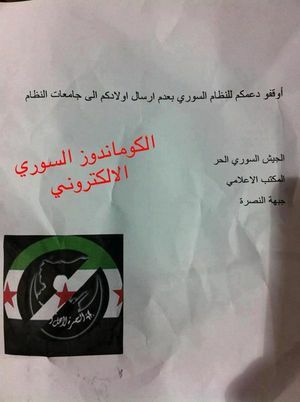 This is one of the leaflets calling for boycotting the exams at Aleppo university. Before the Aleppo University massacre, FSA said, "there will be no learning until the president is gone," and they tried to hold true to this threat. Education and independent thinking are a major threat to these radical groups and their sponsors." He was speaking at a Security Council meeting, on the day of the attack itself. (Youtube video). It was a special meeting in Pakistan, about "conditions that feed terrorism". This came one day after the Security Council received a petition to seize members of the Libyan government for ICC trial, over "authorities' failure to investigate and prosecute war crimes allegedly committed since March 2011." These, as noted, are usually committed right before or during UN Security Council meetings, allegedly by the Syrian government but quite possibly by terrorists - feeding on conditions created by Security Council member states. "SOHR (Syrian Observatory for Human Rights) holds the Syrian regime responsible for the Aleppo University massacre..."
UN Secretary General Ban Ki Moon: U.N. chief condemns Aleppo attack, says targeting civilians a war crime: "Such heinous attacks are unacceptable and must stop immediately. All combating parties in Syria must abide by their obligations under international humanitarian law," Ban said in a statement. "Deliberate targeting of civilians and civilian targets constitutes a war crime." He doesn't specify who he thinks is guilty of the war crime. A photograph of smiling students posing in front a school building is captioned "20 of the students in this picture died yesterday in an airstrike on Aleppo University." One comment offers "BTW the writing on top says" university of architecture engineering," which is the building, aside from the refugee-filled dorm, closest to the strikes. According to Jesuit Refugee Services, there were 60,000 refugees housed in the university dorm as of mid-December, 2012. We don't know how many buildings were tasked for this; there are 17 of this or similar style (48 windows/rooms on each of six floors, for perhaps 288 rooms each). And there are three more buildings of a different style. Presumably both the dorms we can see at least house the displaced; the laundry of people with families to care for hangs out of most windows. These two, if crammed 5 per room, could hold perhaps 5% of the total. Even if all the dorms were filled, more might have to camp outside. Among the attack's detritus is an abundance of light metal frames, twisted, and large plastic sheets/tarps. This plus much clothing, bedding, and blood in the area right out front suggests there may have been a planned "tent city" there, right where the missile hit. The photo at right shows in some detail the tangle of stuff here. Lots of clothes, small furniture, and clear plastic to keep the rain off something. There isn't much for cooking supplies (centralized food preparation?). The spot on the right, foreground, is shown in more detail here: a flattened shoe box, thick blood, part of a sandal, children's clothes (Spongebob!). Students don't have little kids, there with them, usually. A bit to the south, a mostly intact tarp-covered frame shelter of some kind, all but proving that's what this stuff had been. A SANA video shows the intact area up close at 2:50, focusing on what seems to be a booth for serving food (centralized preparation). Below: areas (including the one above) where we can see remnants of damaged encampments relative to (about) where each rocket/missile impacted. This page was last edited on 31 October 2016, at 05:47.